The kitchen is one of the most important and widely used rooms in a house and it’s easy to see why a fitted kitchen in Leicester is called the heart of the home. These days, it’s not only the place where cooking is done, but it’s often the room to eat and socialise with friends and family in, perhaps a place for the kids to hang out and do homework, or even the location for the cleaning of dirty football boots. This is why buying a new kitchen for your home is a pretty big decision and chances are it’s not one you’ll be making overnight. At Dewhirst Kitchens, we have been providing bespoke kitchens and fitted kitchens Leicester way for over 60 years. At Dewhirst Kitchens, you can rest assured knowing that we are members of the Kitchen Bathroom Bedroom Specialists Association (KSBA). As members, one of the many benefits to you is that your deposit is protected. Other benefits include comprehensive consumer benefit schemes and guaranteed quality of work. As such, we know that, if you do make the decision to change your kitchen, you’ll want to give plenty of thought to style, size, cost, layout and design. What Are The Benefits Of A Fitted Kitchen? 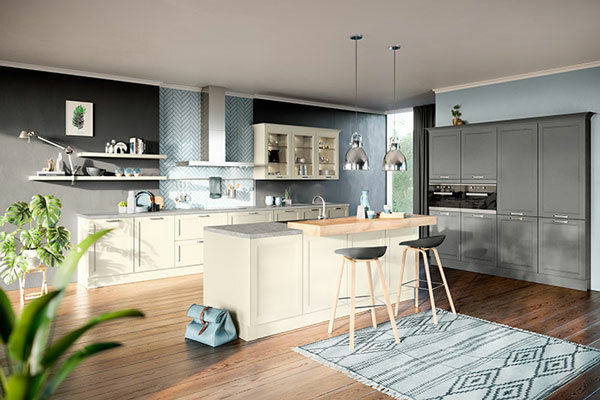 You might want a little help and guidance on the options available regarding colours, lighting, textures, worktops, appliances and finishes, so you’ll be pleased to know that when it comes to fitted kitchens Leicester based Dewhirst Kitchens is always on hand to help customers find the perfect one for their needs. We supply and fit many leading quality brands of kitchens, including Miele, Stoneham and Hacker. We also supply a wide range of kitchen appliances from leading brands such as Neff. We are proud to say that Dewhirst Kitchens has built up an excellent reputation over more than 60 years for being one of the best kitchen providers in Leicestershire. When you’re on the hunt for fitted kitchens Leicester way and you drop into our Granby Street showroom, you can benefit from our many years of experience, expert advice and in-depth discussion centered around achieving exactly what you’re looking for. Our talented designers can then get to work in creating the kitchen that is exactly what you’ve been dreaming of, even down to the very last detail. Come and take a look at some of the fantastic kitchens we have on display, spread out over three floors and featuring fitted kitchens from all over Europe, which offer the very latest in traditional and contemporary design. Once you’ve got a flavour for what you like, have a chat with one of our experienced and friendly members of staff or make an appointment to discuss your fitted kitchen at a later date. Once you have the design that you like, we will have your kitchen built and deliver it to you where it can then be fitted by our expert kitchen fitters. Come and have a browse around our Leicester fitted kitchens showroom or contact Dewhirst Kitchens today, to book an appointment with one of our design consultants, we’d love to hear from you.